Career Highlights – Hey, Look! A Writer Fellow! I love to take part in flash fiction contests because they force me to push my mind in new and unexpected directions. So last year, when Susanna Leonard Hill announced a “Fourth of July Mystery” writing competition, I was eager to give it a go. The timing of the contest also turned out to be excellent. I was in-between projects and was stumbling around trying to figure what to work on next. So, a Fourth of July Mystery it was! Even though I was less than eager to tackle another holiday story, I figured that, at the very least, it would be a fun writing exercise. 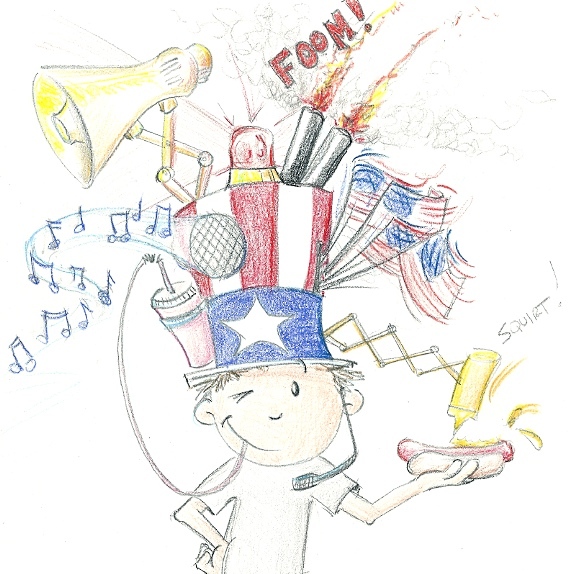 “Mwah-ha-ha!” This year the ever-inventive Harold is definitely going to beat Betsy Lominzer in the Fourth of July Patriotic Hat Contest. His creation has it all: flashing lights, a siren, megaphone, music, battery-powered flag waving action and shooting sparks. How could Harold possibly lose with something that awesome? Here’s one way: He could lose his hat! With only minutes before the competition begins, can Harold find his creation and get to the town square in time to square off against his hat-making nemesis? I was pretty happy with the result, so I decided to revise the story and attempt to sell it somewhere. About three seconds after finishing said rewrite, I stumbled upon the theme of the 2014 Highlights Fiction Contest: “Holiday Stories.” This, I figured, was too big a coincidence to ignore. So I didn’t. When the Highlights editor wrote to tell me, she said that she was “eager to announce my win to the world.” She followed up this statement with a “Mwah-ha-ha,” which I found pretty hilarious. Needless to say, I am so very grateful to Susanna — who is the very definition of wonderful. Just one look Susanna’s blog proves it; every post – every single freakin’ post – is designed to help her fellow writers succeed. That was certainly true in my case. If it wasn’t for her contest, I never would have come up with this story. When I rewrote Harold, I asked several talented bloggers for feedback. Cathy Ballou Mealey, however, deserves to be singled out for special praise. Her thoughtful critiques inspired me to push Harold in new and considerably more exciting directions. I believe that if it wasn’t for Cathy’s comments, Harold’s Hat wouldn’t have won a darn thing. What I’m trying to say is that my writing is so much richer now that I am a part of a blogging community. This win proves it. Thanks, everybody. I am so very grateful. Congrats Mike and three Hip! Hip! Hoorays! for both Cathy and Susanna! Thanks, my friend. Now, you better start submitting a few of your 100-word stories! Yep. I kept the Sinatra reference intact and Highlights still bought it! Now….how do WE mere mortals get to read the story?? Actually, that’s Susanna Hill Contest submission. The story I submitted to Highlights is different (and better!). As soon as it’s published in the magazine, I’ll let you know. Awesome! I would like that! One thing I need to ask though—-did YOU do that SPECTACULAR illustration?!!!! Yep, I did the above drawing. But “spectacular”? Come ON. 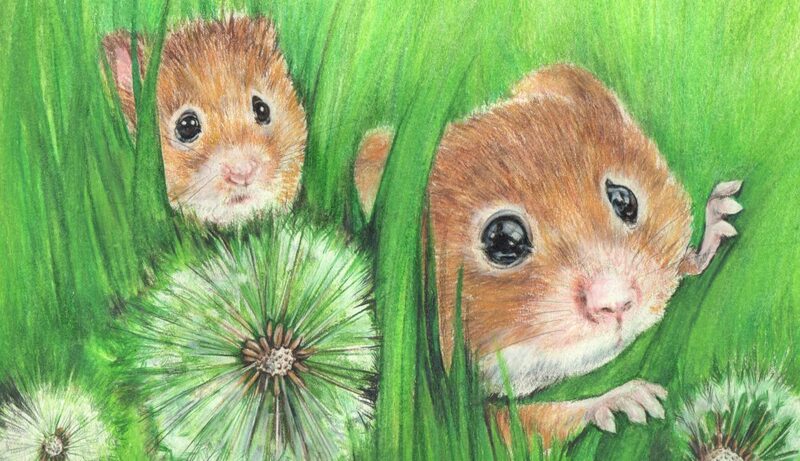 You, my friend are the spectacular illustrator. I am just a happy doodler. That’s very kind of you to say, Donna. I’m glad you like it. Aww – what a nice shout out! Definitely super props to Susanna – it was her very first Halloweensie contest that gave me the boost I needed to pursue writing more seriously. She is a true, bright North Star in the constellation of kid lit writers! Congratulations on your wonderful and well-deserved success. May it be the first “Highlight” of many bright, happy events! Susanna is pretty selfless, that’s for sure. And thank you for everything, my friend. I owe you one. How would you like a Fluff Monkey? Yes, a trained one please. Check your mailbox next week. Congratulations, Mike! Wonderful news, and I can’t wait to read it. Thanks in advance for brightening the 4th of July with your special brand of heart and wit. Oh, you! Here’s hoping your Fourth is happy, David! This is fantastic news! So pleased for you 🙂 So thanksgiving, 4th July, can we expect more holiday stories from you soon? I can see the full collection already! What (celebrated in America) holiday do you think I should consider? Highlights is a great company for a children’s writer. Don’t be put off by them buying all rights. They pay the highest rate I know of, plus if they use your stories elsewhere (test formats) you get a courtesy check. Their workshops are amazing. Congrats on your win! Now that you’re in their system they will look at your submissions more readily. It’s funny you say that. When I received the Highlights contract, I was reluctant to sign for that very reason. I expressed my concerns to Highlights in an email and, later that day, an editor called me up and explained the courtesy check arrangement among other things. It was a lovely conversation. I wouldn’t hesitate to submit to them again. I truly have enjoyed my experience with Highlights. They are courteous and professional, yet instill a sense of family. I managed to check off one of my B.I.G. List items when I attended a Chautauqua Highlight workshop a few years back. Best week ever! I’m having BBQ with Jerry Spinelli, dinner conversation with publishers, one-on-one conferences with authors and editors. And THE Kent Brown remembered my story when I introduced myself. So doubt no longer, my friend, and welcome to the Highlights family! Wonderful news. You have great helpers with Cathy and Susanna. (Well, they help us all). Look forward to reading your winning entry in the magazine. Cathy and Susanna are great people to be sure. But they are just two among dozens of generous blogging souls I have met who are inordinately kind and supportive. And, yes, I’m lookin’ right at you, Stacy — you wonderful PPBF selector and Amazon commenter, you! Do give your sister my best wishes, won’t you? I will always have a soft spot in my heart for her “Goldilockup” cover. You’re “not old enough yet?” You giving me the business? And yes, I also get a generous chunk of prize money. I’ll be classy and not tell you the dollar amount (but a “simply curious” person with a internet connection could get that number in about three seconds). I don’t need to know the amount unless you are passing the check on to me. I didn’t know if it included any of Highlights workshops. That would be a great prize. Congrats again. I bet your son would love a Toys R Us trip. Lovely story! Congrats Mike, that’s wonderful news. Great stuff, Mike! Congratulations and I hope this marks the beginning of many more wins for you. Love the Mwah-ha-ha’s all around. Ah, I can see all those future wins now…Mwah-ha-ha! Winning was like, you know, like, “WOAH!” You know? Pleast tell me you KNOW who I’m referring to! I think the entire world has seen Finding Nemo by now! And indeed Susanna is; she is all that and a bag of chips. I thank you for your “booyahs” and your other kind words, Harula. That’s a whole lot of awesome. Oh, and forgive me for taking a jillion years to respond to your comment. Somehow it slipped through the cracks. That’s ok. I had faith you would get back to me. Congratulations, Mike! That’s wonderful and obviously very inspiring for us all. I have to say I love the drawing of “our hero”. Such talent. Thanks, my friend. My trophy came in the mail today, so I just got an extra dose of giddiness. I hope you are taking a picture of it for us. I will now! I’ll put something on my Facebook page soon.